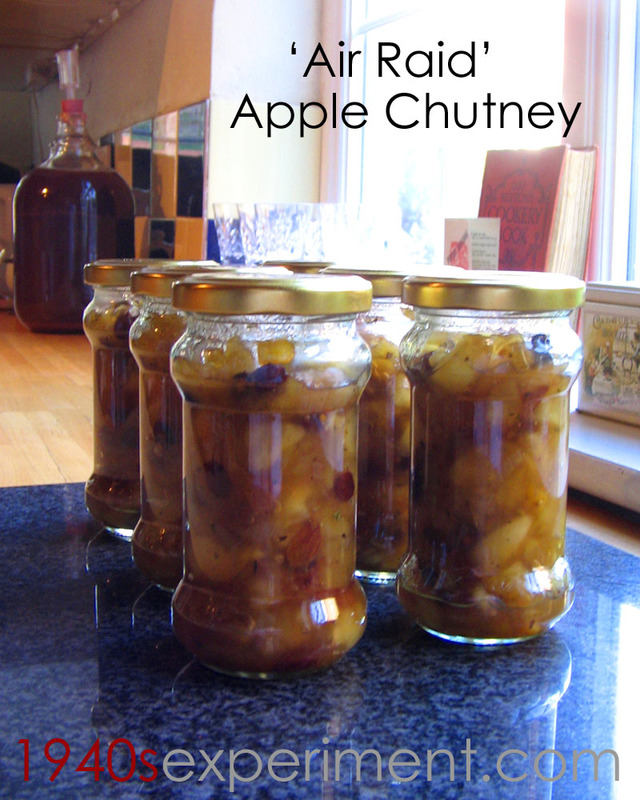 BUT the discomfort was worth it as now I have 6 small jars of delicious ‘Air Raid’ Apple Chutney in my cupboard and after it has matured for a week or so, it will be used frequently on my plate to liven up the sometimes samey meals. Why ‘Air Raid’ chutney? I’ve listened to folk who lived through the war and it seems that quite often, if food hadn’t been prepared and set aside to take into the Andersen Shelter, food like bread, jam and chutney were often grabbed from the larder on the way out of the door for something to nibble on. 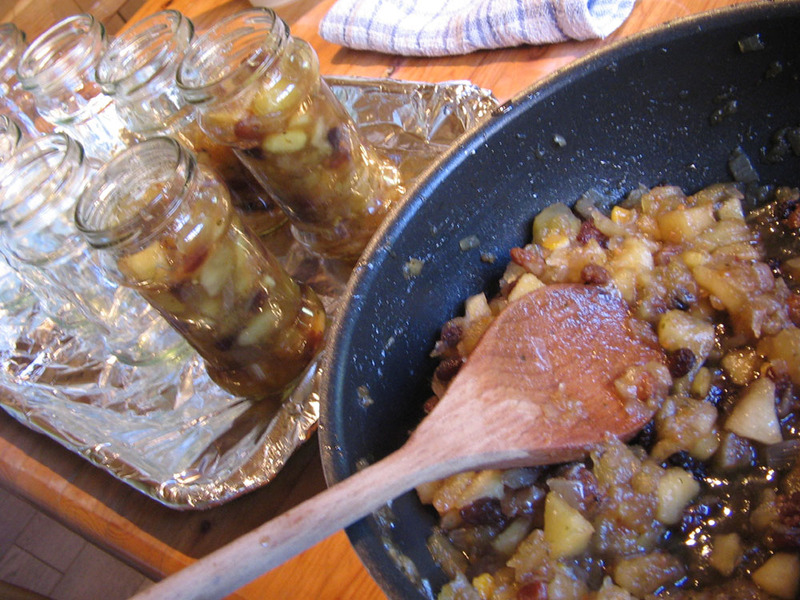 Here is an authentic wartime recipe for apple chutney.. Remove the bag of pickling spices and add hot mixture into clean hot jars (I wash, rinse then heat in oven on medium for 30 minutes) and immediately screw on clean hot lids. Leave to cool the store in larder for at least 1 week before trying. Matures after 14 days..
PS I made some good old fashioned ‘stout’ and bottled it last week. This is a piccy of the first bottle I opened. 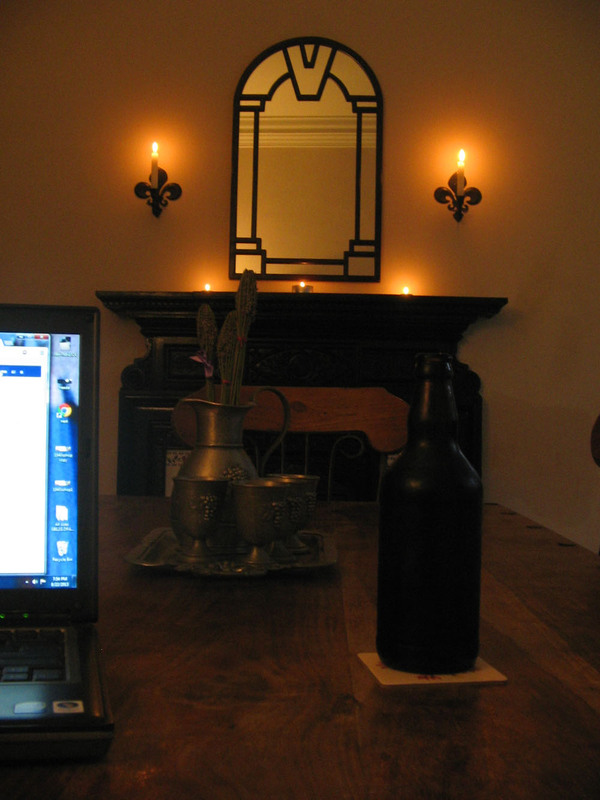 It tasted lovely and I sat by candle and computer light savouring the moment! This entry was posted in Uncategorized and tagged air raid apple chutney, wartime recipes. Bookmark the permalink. ooh lovely Im always making chutney with whatever is left in my VegBox, lovely with bread and cheese…no Anderson shelter required!…will deffo give this one a try….now of course what we really want is the recipe for the stout! I made this lots of times. It is great! I have also used pickling vineger and one time all I could find was cider vinegar and 5 spice powder! It worked a treat that is true rationing improvisation. This sounds great as well. When I’m feeling very ambitious, I will try it. I seem to remember you weren’t very impressed with your wartime curry, but I wondered at the time if that was because it was carrot and therefore too sweet? My point being that chutney is a key ingredient in wartime curry and I do have a bit of a warm (smug) glow when I put my homemade wartime chutney into my wartime curry. In fact I did just that this afternoon. I’m going to put a tin of sardines in and serve it over rice. Fingers crossed it tastes better than it sounds…! Cauliflower and potato work really well. This looks soo good. What kind of dried fruit is in it? I live in the Northeast US and apple season is upon us, I would like give this a try. I love the way you’re throwing yourself into all this.What makes it so good is that you need to live like this and it’s not just a hobby or novelty. Making chutney, however, is a great thing for everyone to do . 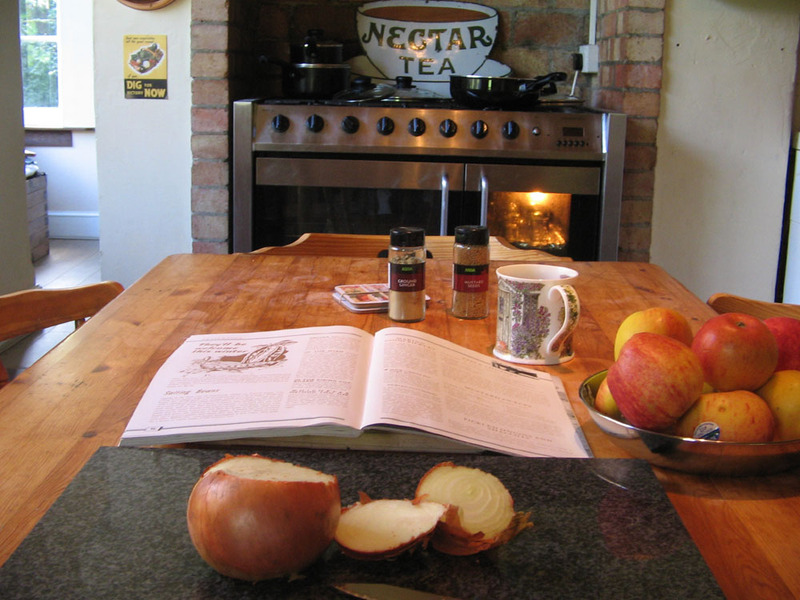 I have a huge pan of apples on my kitchen worktop waiting for inspiration. I may as well use your recipe as go searching round for something else while the apples rot. It’s sunny today so I can open all the doors! PS I love the look of your new house and I hope you can keep it for as long as possible. I’ll have access to loads of free, unsprayed apples this Fall — definitely bookmarking this one for future reference….! What sort of apples would you recommend?